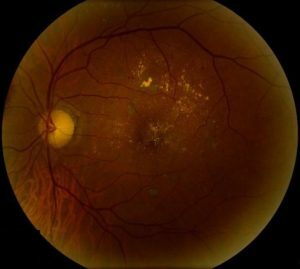 A 63-year-old African man presenting with complaints of intermittent flashing of the left eye which resolved spontaneously two months ago, as well as chronic blurry vision in the context of non-proliferative diabetic retinopathy. Type II diabetes mellitus with known non-proliferative diabetic retinopathy, for which he takes Metformin, and hypertension which is controlled on amlodipine. 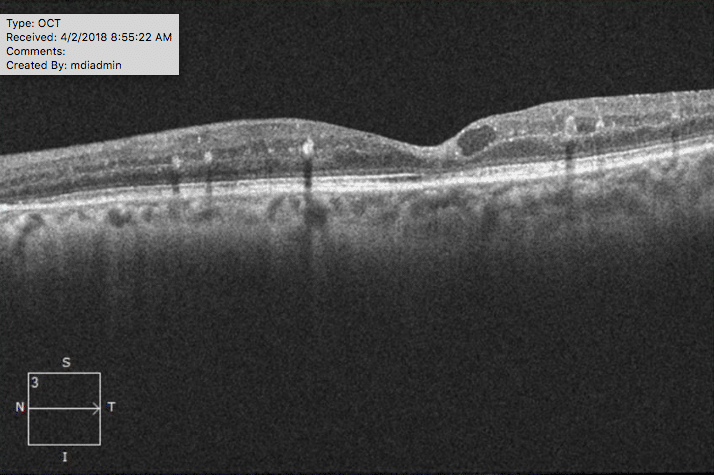 Patient had had prior retinal laser treatment in the left eye. Emigrated as an adult from Africa. No smoking history. The patient’s visual acuity is 20/60, PH 20/25, in the right eye and 20/150, PH NI, in the left eye. Intraocular pressures are mildly elevated at 25 and 24. Pupil, motility, and confrontational field examination were within normal limits. Slit lamp examination showed a normal ocular surface and anterior chamber, showing only 2+ nuclear sclerotic cataracts bilaterally. Posterior segment examination demonstrated posterior vitreous detachment in the left eye, syneresis only in the right. Optic discs were normal in appearance. The retinal vasculature was notable only for mild attenuation in both eyes. The macula of both eyes showed moderate hard exudates, mild macular edema, and scattered dot blot hemorrhages. However, there were also yellow-green refractile crystals noted scattered in the parafoveal area of both eyes. Additionally, focal laser scarring was noted in the left macula. 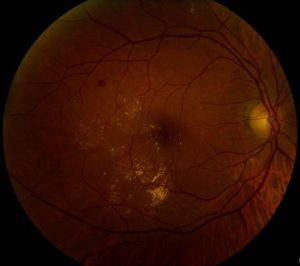 Peripheral retina examination was notable only for scattered intraretinal hemorrhages without any sign of neovascularization. 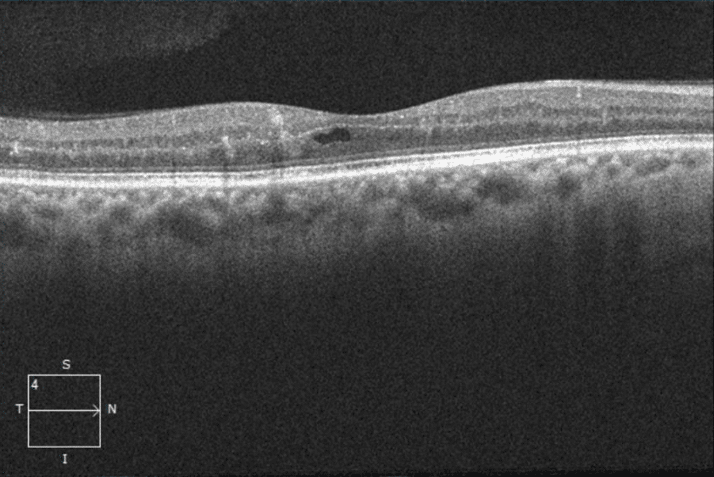 OCT showed mild intraretinal fluid and hard exudates in both eyes, consistent with diabetic macular edema. West African Crystalline Maculopathy is a syndrome, first described by David Sarraf, MD et al in 2003, defined by iridescent foveal crystals, found only in elderly members of the Igbo tribe of Nigeria. It is characterized by bilateral, asymmetrically distributed refractile, yellow-green colored, superficial deposits in the fovea. 1 These are believed to cause no apparent visual consequence or detriment. Brown also hypothesized that break-down of the blood retinal barrier, particularly in retinal vascular conditions such as vein occlusion or diabetic macular edema, plays a large role in the pathogenesis of crystal formation. In addition, it is thought that the distribution of the crystals is a dynamic one, showing changes following laser photocoagulation of these conditions.3 In our patient’s case, crystals are noted concurrently with extensive macular edema. 1.Sarraf, David, et al. “West African crystalline maculopathy.” Archives of Ophthalmology 121.3 (2003): 338-342. 2. Rajak, Saul N., Moin D. Mohamed, and Lucia Pelosini. “Further insight into West African crystalline maculopathy.” Archives of Ophthalmology 127.7 (2009): 863-868. 3. Browning, David J. “West African crystalline maculopathy.” Ophthalmology 111.5 (2004): 921-925. 4. Nadim, Farah, Haddad Walid, and Jaber Adib. “The differential diagnosis of crystals in the retina.” International ophthalmology 24.3 (2001): 113-121.